Rebecca Dallet's hammering of conservative judge Michael Screnock on Tuesday prodded Republican Gov. Scott Walker, who had endorsed Screnock, to warn his fellow Republicans that more losses could be coming. 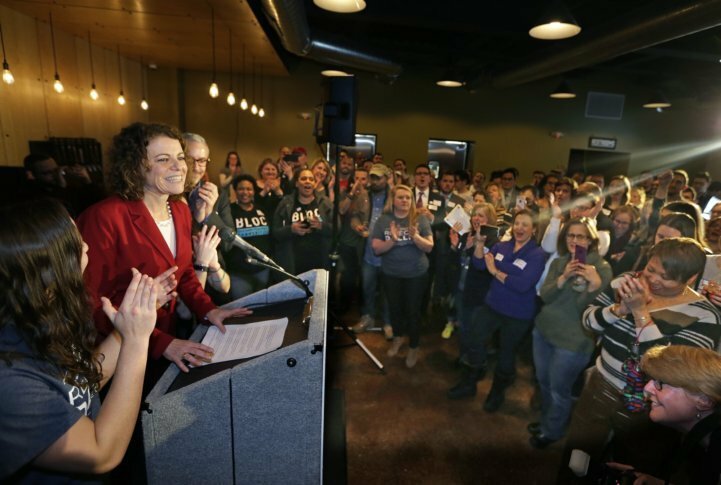 MADISON, Wis. (AP) — Liberal judge Rebecca Dallet’s runaway victory in a Wisconsin Supreme Court race cheered Democrats eager for more evidence their party is ready for a winning fall in midterm elections. And Dallet’s hammering of conservative judge Michael Screnock on Tuesday prodded Republican Gov. Scott Walker, who had endorsed Screnock, to warn his fellow Republicans that more losses could be coming. Although the race was viewed by some as a bellwether, results of past Supreme Court elections have not consistently proven to be predictive of what will happen in November. President Donald Trump won the state by less than 1 percentage point in 2016, while Dallet thumped Screnock by double digits. Dallet won by nearly 12 points with unofficial results nearly complete. One of the Democratic challengers to Republican House Speaker Paul Ryan, of Wisconsin, immediately tried to raise money off the Dallet win. Randy Bryce called the Dallet win “a rallying cry for working folks.” Walker also used the results to raise money. Dallet’s victory follows a surprising Democratic win in January in a special election for a state Senate seat held by Republicans for 17 years — an outcome that Walker said then was a “wake-up call” for his party. Two other special legislative elections are coming this June, giving Democrats more chances to build momentum heading into the fall. The race for a 10-year seat was nonpartisan in name only, with millions in ad spending and public endorsements from the likes of Joe Biden, Eric Holder and the National Rifle Association. Dallet said her victory, which Democrats quickly seized on as another sign of momentum, was a rejection of special interest influence on Wisconsin’s Supreme Court. Screnock, a Sauk County circuit judge, was endorsed by Walker and backed by about $400,000 from the state GOP. Dallet’s victory narrows conservative control of the court from 5-2 to 4-3. She also will become the sixth woman on the court. And it’s the first time a liberal candidate has won a race for an open seat on the court since 1995. The court has been a reliable ally of Walker and Republicans who have controlled the governor’s office and Legislature since 2011. Voters who supported Dallet said they hoped her win would send a message. “People are pretty motivated on the left, from what I can see,” said Doug Clawson, 58, a communications professional who cast his ballot at a Madison public library as cold rain fell outside. Dallet, 48, has been a Milwaukee County circuit judge since 2008 and previously worked 11 years as a prosecutor. She will join the court in August. Screnock, 48, was appointed judge by Walker in 2015. Before that he was part of a team that defended Walker’s Act 10 law that effectively ended collective bargaining for most public workers. Both candidates argued the other couldn’t be trusted to serve as an independent voice on the state’s highest court because of the partisans supporting their campaigns.